The University of Glasgow is offering scholarships to International applicants to pursue masters program. The candidates applying for University of Glasgow International Leadership Scholarship, 2017 should be International or non-EU students. have grades equivalent to UK 1st Class Honours. have an offer from the University of Glasgow for postgraduate taught program. be classed as international for fee purpose. The applicants for University of Glasgow International Leadership Scholarship, 2017 are not required to submit a separate application form. The candidates will be automatically considered for the scholarship based on their academic merit. 1 December will be informed by 16 December. 1 March will be informed by 16 March. 1 June will be informed by 16 June. 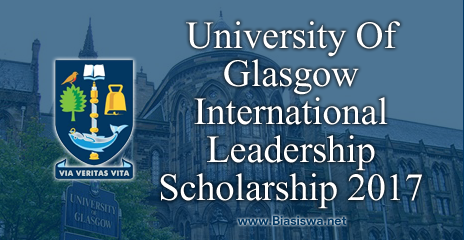 The recipients of University of Glasgow International Leadership Scholarship, 2017 get £10,000.